At Gibraltar SF we’ve been investigating NFC technology for the last couple of years, basically focusing in use cases, software / hardware implementation and security aspects. One of the main problems we had was the lack of commercial mobile phones with NFC capabilities. So, we’ve been programing NFC using the Series 40 Nokia 6212 NFC SDK simulator with external tag readers. I mean, although they were some developer version phones with NFC like Nokia’s 6212/6131 or even the Samsung’s s5230 used in the Sitges pilot, they weren’t available for the final user, so the projects turn into pilots and not into a real solution platform. But things are starting to change. On December 16th, Google launched the Nexus S, a phone co-developed by Google and Samsung, with the newest version of its operating system Android 2.3 and built-in NFC functionality. And everyday there are more reports and rumors about new NFC-enabled smartphones headed to market, included the new Samsung Galaxy S2, a couple of Blackberrys and the next Iphone 5. Well, today we finally got the Nexus S in our labs, so we are porting our software to the Android platform. 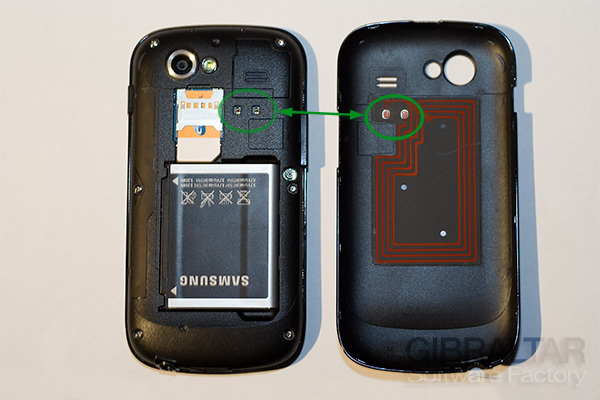 When you open Nexus S to put the battery in, you’ll see the 4 turns NFC antenna embedded in the back cover, it looks like a sticker. There are 2 gold contact points which connects this when you close. We also found an antenna jack so you can plug an external gsm antenna, good for country drives to get much more constant reception. You can see a great full teardown of the handset at iFixit. This phone comes with a PN544 standard NFC controller form NXP which can connect to a SIM using the standardized Single Wire Protocol (SWP). This chip can also do card emulation, read and write tags and exchange data in p2p mode, as far as the RF signals are concerned. We’ll be posting more about our experience on this phone and the NFC feature over the next few days. Tagged Hands on, Nexus S, NFC. This is very useful analysis report, I do appreciate so much! 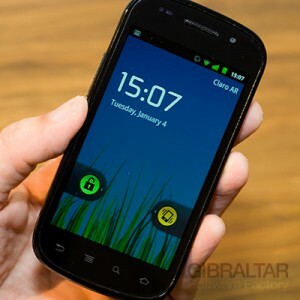 It should be very nice if you could make same with LG NFC latest smart phone. NFC could be the killer functionality of the next coming smart phone which could create more smart wireless connectivity as well as WiFi communication, question is so that space problems would be the most critical issues as you pointed out in your article NFC, WIFI + penta band antenna, foot print is quite limitted and more miniaturization is required .